The actor Mizuki Tatsunosuke I held this name from 1690 to 1704. The actor Yamatoya Jinbê IV held the name of Mizuki Tatsunosuke II from the 11th lunar month of 1737 to the the 10th lunar month of 1747. Dates of birth and death unknown. 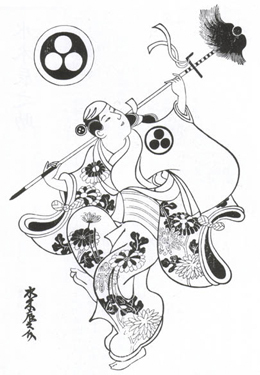 Disciple of Mizuki Tatsunosuke II, he received the name of Mizuki Tsunejirô. He was recorded as performing as a wakaonnagata in 1752 in Kyôto. He took the name of Kikukawa Tsunejirô at an unknown date. He went to Edo in Fall 1758 and took the name of Mizuki Tatsunosuke III in the 11th lunar month of 1758 at the Nakamuraza, performing in the kaomise drama "Kigoto no Hana Aioi Hachinoki". 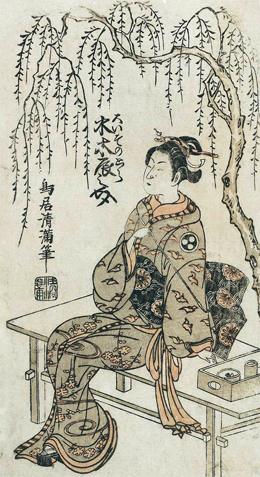 He took the name of Kikukawa Kiyotarô in the 11th lunar month of 1759 at the Moritaza, performing in the kaomise drama "Toki Tsukaze Heike Monogatari". He went back to Kyôto in 1761 and played in the 12th lunar month of 1761 at the Kitagawa no Shibai the role of Koman in the kaomise drama "Karanishiki Miyako no Hinagata", which celebrated the shûmei of Takeshima Kôzaemon IV. He was active in Kyôto up to 1764. 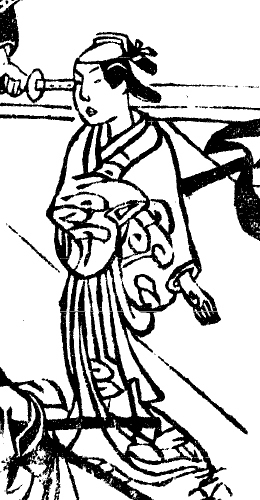 His rank in the 1764 Kyôto hyôbanki, wakaonnagata section, was jô-(shiro)jô (superior - (white) superior). No record afterwards. He was said to be better in sewamono rather than jidaimono, excelling in keisei roles.